Picking out bridesmaid dresses is a rite of passage in wedding planning and Revelry makes it easier and more fun than ever! With their convenient Sample Box, you and your bridesmaids can “try before you buy” a multitude of skirt, top and dress options from sizes 0 to 32 in the comfort of home. And for summer 2018, they’ve rolled out fresh new styles inspired by customers just like you. 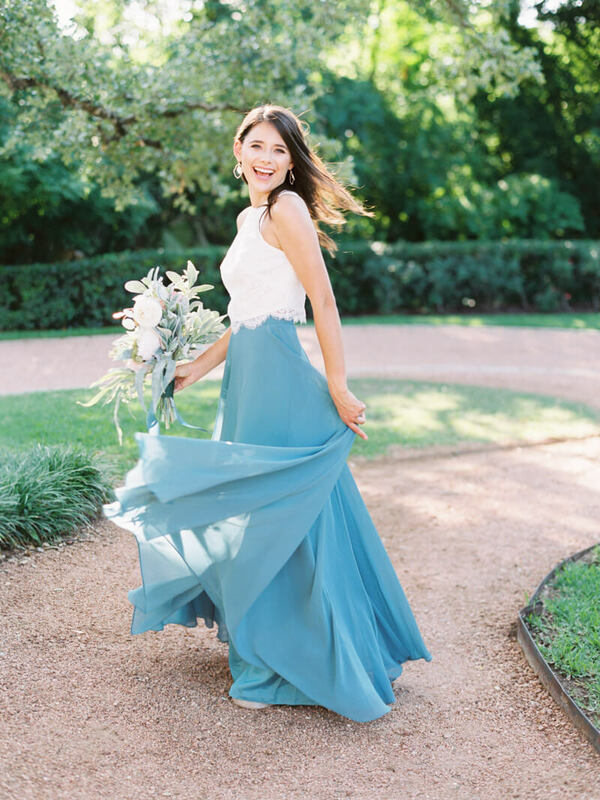 With a Sample Box, your bridesmaids have the luxury of trying on classic and trendy styles, and mixing and matching pieces in over 100 different colors and several different fabrics, including Revelry’s brand new flowy chiffon. This Elle chiffon dress looks great in any shade and features a high neckline, a modern empire style waist and a full, flowing skirt. The Juliet is a long-sleeve chiffon dress that’s perfect for those chillier outdoor affairs with its longer sleeves and flowing chiffon skirt. With Revelry’s four different length options, you can ensure it’s a proper fit. Revelry also offers a plethora of top and skirt choices to mix-and-match. The Aubrey, seen left, is a gorgeous lace top with a high neckline and eyelash hem. The Willow, seen right, is a similar lace style but features the on-trend cold shoulder look with bell sleeves. 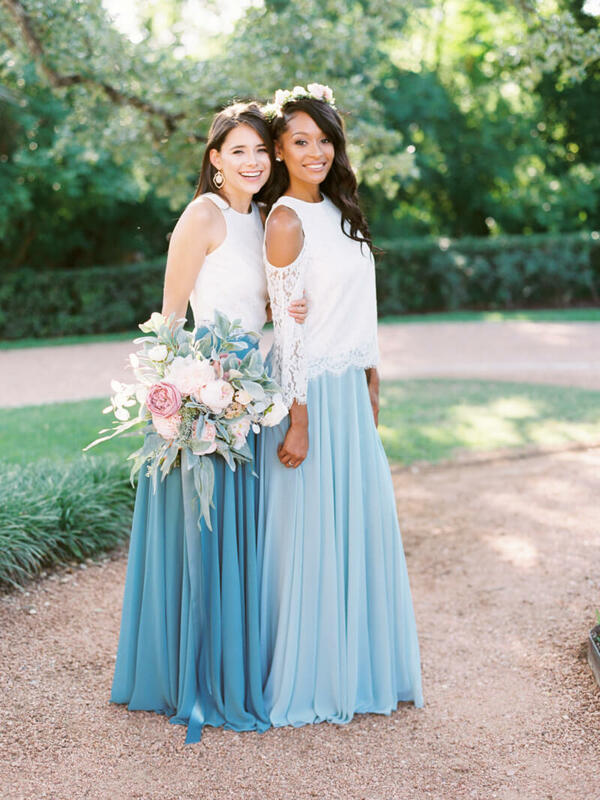 Both lace tops are paired with long chiffon skirts in whimsical shades of blue. Another summer favorite is Ainsley – a dress which features a camisole top and cut-out back. The airy chiffon skirt makes it effortless and comfortable for summer weddings. Revelry also offers dresses in tulle and sequins if you’re going for something more dramatic or glamorous. 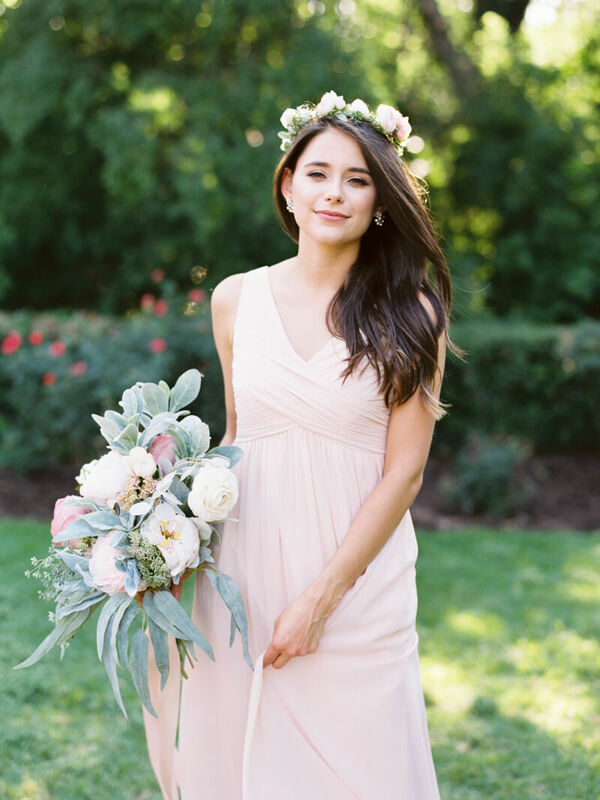 Two bridesmaids don the high-neck Elle chiffon dress in different colors, but another bridesmaid shows how a blush sequin top and white chiffon skirt can truly pop. For a more dramatic look, Revelry offers tulle designs that bring drama and sophistication. The Aria features a crisscross ruched neckline and an eye-catching keyhole back with a long tulle skirt. The pieces in Revelry’s separates collection are designed for wear after the wedding, too. This lace top could easily be worn with a cute pair of shorts and the skirt could be paired with a sleek bodysuit for a casual night out. Sequin dresses come in various necklines to suit your girls’ needs. The Starla, seen right, features an asymmetrical shoulder, while Bijou has a V-neck. 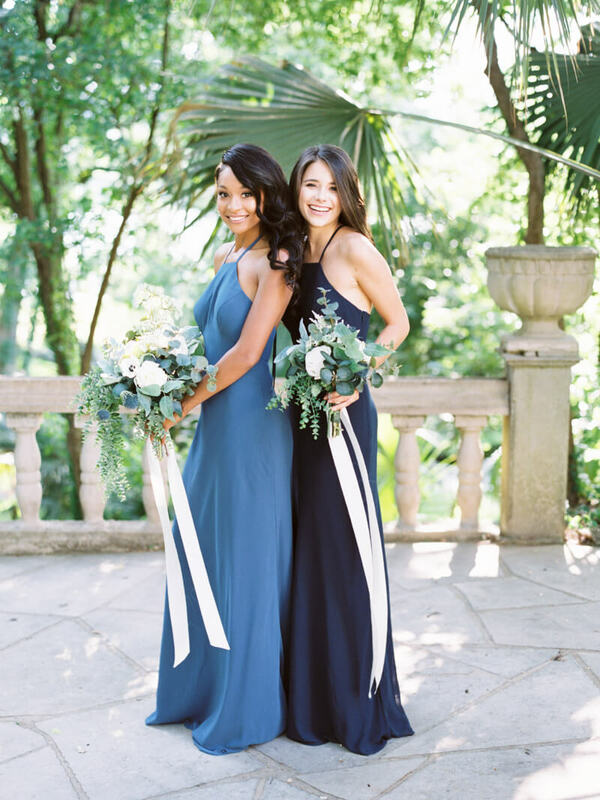 You can play with various necklines and incorporate different ones that make your bridesmaids feel their best. Revelry tries to make its pieces as versatile as possible, too. The Lily chiffon dress not only looks darling in any shade, but its thin straps are adjustable and the off-the-shoulder straps can be removed for a whole new look. The Zoe chiffon dress is great for bridesmaids who prefer supportive straps. It features a flattering crisscross body design and thicker shoulder straps for comfort and confidence. The Mackenzie is a great style to celebrate color and incorporate various shades into your bridal party. Here we see three different colors for one group. Using the color swatches in the Sample Box can help you bring your vision to life. More and more brides are letting their bridesmaids wear white and it’s a trend Revelry can get behind. These white chiffon tops look bright and glamorous with Revelry’s sequin skirts. Revelry’s bridesmaid dresses aren’t just stylish, they’re affordable, too. Every piece is made-to-order and is a fraction of the price of traditional bridal salons. And since Revelry ships internally, you can get your Sample Box delivered straight to your door no matter where you are. Visit shoprevelry.com to see for yourself how Revelry makes shopping for a bridesmaid dress easy and fun. Make this one item on your wedding checklist a celebration for the most special ladies in your life!